Just like your average, run-of-the-mill, everday addict, I was craving my next hit of inexpensive makeup (hey, it could be worse). As I said in my previous post (here) ELF had come out with 4 new makeup brushes, in addition to a several very interesting new products. Plus, the Free Gift Set (with orders of $25+) actually seemed worthwhile. Plus, I’d racked up enough points from their loyalty program to spend. Plus, they were giving away a full-sized product as a Free Sample. I had my eye on several of the creamier makeup products, as well as some skincare, but I was worried that they might go bad or melt in the heat. That’s why I decided to wait until the weather cools down in Kuwait before ordering them and also why this particular order consisted mostly of powder products, makeup brushes and tools (products that were relatively unaffected by heat). That said, I wasn’t sure that Aramex would even deliver some of the skincare items, especially the sprays (due to shipping restrictions) so just to experiment (test the waters), I ordered a full sized 3.38 fl. oz. (100 mL) Cleanser and a full sized 2.70 fl. oz. (80 mL) Setting Mist, both of which actually made their way to me (yay)! 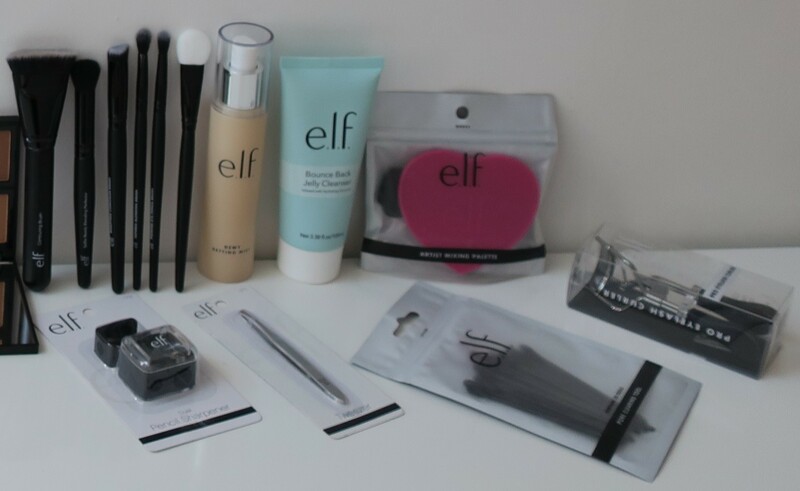 Since my previous order (haulage here), about 4 months ago, ELF had come out with a bunch of new products (including 4 new Makeup Brushes). At the time of this order, they had a promo which included a Free Plump It Up Gift (3pc) with any $25+ order, in addition to a Free Sample with every purchase. I’d accumulated enough points (you get 50 point just for signing up) to pick out a Free Gift of my choice (from select items). I figured it was worth placing an order right then and taking advantage of all the deals and promos and such. Mostly, I just wanted to give those Makeup Brushes a try! Generally, I try to stick to a budget of around $100 (otherwise it’d be too easy to go overboard without even realizing it). The subtotal for this order was $100 (minus the $8.87 sales tax), which I felt was close enough to my personal target.